For more than 100 years, the historic Slaughter Ranch in Douglas, Ariz., went untreated for the termite infestation that was contributing to its deterioration. Because the wooden structure was built directly into the ground in the late 1800s, local pest control companies were reluctant to attempt treatment. Poor Boy Termite Control of Scottsdale, Ariz., assessed the structure for termite damage for the first time in January of 2004. After finding that it was overrun with termites, they took on the task of ridding the structure of its current infestation and preventing future outbreaks by treating with Premise Termite Control. SOME HISTORY. Now a national historic landmark, the Slaughter Ranch came to notoriety when John Horton Slaughter acquired the land in 1884. Slaughter and his family were among the pioneers in the development of the cattle industry in South and West Texas. As sheriff of Tombstone’s Cochise County, Slaughter became known as one of the West’s most fearless and efficient law officers. Today visitors can go back in time at Slaughter Ranch, where the old adobe ranch house has been meticulously restored, along with the ice house, wash house, granary, commissary and car shed, to experience life at the turn of the century. “We chose Poor Boy for the treatment because they are known throughout the area for always using the most current treatment methods and technology, and are always ahead of the game,” Finks said. 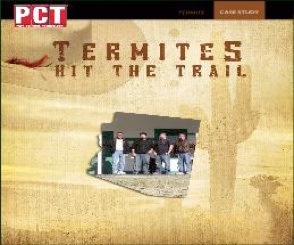 Since 1976, Poor Boy Termite Control has been standing out among Arizona competitors with its unique approach to pest control. Using a “no-drill” treatment method, Poor Boy directly treats termite infested structures, rather than using a traditional ground treatment. Poor Boy treated the Slaughter Ranch for drywood and subterranean termites using Premise 75 WP, and Premise Foam for the sensitive areas of the structure. After being introduced to the microwave technology of the Termatrac detection system, Poor Boy performed a follow up assessment of the Slaughter Ranch in December of 2006. Using Termatrac and infrared cameras, the Poor Boy team was able to detect termite activity more effectively, and identify problem areas on the structure.